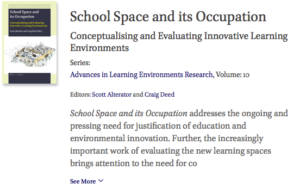 In a new book School Space and its Occupation, edited by Scott Alterator and Craid Deed, Wesley Imms considers how historical developments in school design and teaching, as well as emerging research can inform the current debate on what types of learning spaces are needed in our schools. Various announcements about the death of the traditional classroom are proving premature; first because research is not providing conclusive evidence that ‘non-traditional’classroom spaces have advantages that warrant such pronouncements; and second, because traditional classrooms are needed in any school that seeks true spatial flexibility. The focus of mature debate on this topic is shifting from advocating radical departures from the norm, towards the provision of a range of spaces that accommodates the huge array of preferred leaning and teaching styles that occur in schools. …. Read Wes’s chapter here.